Aug. 30, 2001 -- At the height of the Cold War, they first leapt from the pages of MAD Magazine: A white-garbed secret agent and a black-garbed secret agent locked in a mute, cartoon dance of mutual destruction. Click the image to view a slideshow of one of the first "Spy vs. Spy" cartoons, which ran in Mad magazine #60 in January 1961. Today, 40 years later, the comic strip "Spy vs. Spy" remains one of MAD's longest-running and best-known features. The Spies' creator, cartoonist Antonio Prohias, died in 1998. But his work has been collected in a forthcoming book, Spy vs. Spy: The Complete Casebook (Watson-Guptill Publications, October 2001). And his legacy is nurtured by his eldest daughter, Marta Pizarro, and his longtime editor, Nick Meglin, who spoke about the Spies phenomenon with NPR's Renee Montagne. 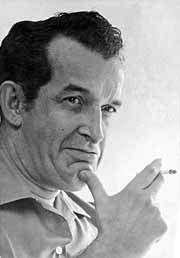 In his native Cuba in the 1950s, Prohias was an award-winning editorial cartoonist. After the revolution, his blistering caricatures drew Fidel Castro's wrath. So in May 1960, Prohias fled to New York City, where he worked in a clothing factory by day and honed his cartoons at night. Inspired by the polarization he saw in his homeland -- where anyone who was not a vocal Communist was dismissed as an infidel -- Prohias devised his black and white spies. He once described them as "two sinister men who do terrible things -- but to one another, and then nobody will make a fuss." With Marta (then 14) along as translator, Prohias took the comic strips to MAD's offices, where editors snapped them up. The Spies have appeared in virtually every issue of the magazine since (though other artists and writers "ghosted" the strip after illness forced Prohias' retirement in the late '80s). "And 40 years later, maybe a couple more."